Semtech – headquartered in Camarillo – donated proceeds from its annual charity golf tournament to Big Brothers Big Sisters of Ventura County and RAIN Communities, Inc.
Semtech Corporation (Nasdaq: SMTC), a leading supplier of analog and mixed-signal semiconductors headquartered in Camarillo, hosted its fourth annual mid-season golf tournament benefiting local charitable organizations on June 17 at the River Ridge Golf Course in Oxnard, Calif. Through sponsorships, entry fees, raffles and more, the company raised approximately $53,000, which it donated to Big Brothers Big Sisters of Ventura County and RAIN Communities, Inc.
For the past several summers, Semtech has hosted employees, family and friends for a full day of festivities, including a putting contest, a shot gun-style golf tournament, a silent auction and raffle, as well as a dinner and award ceremony. The event is used to raise funds for the benefit of the Ventura County community. Marquee sponsors of this year’s tournament were O’Melveny & Myers LLP and Paradise Chevrolet. Big Brothers Big Sisters of Ventura County is a local nonprofit that serves children who face adversity through professionally supported, one-to-one mentoring relationships. The organization serves to improve its children’s performance in school, self-esteem and career trajectory. RAIN Communities, Inc. is transitional housing program in Camarillo that helps individuals and families in the county who are in need of housing assistance for a transitional period. RAIN supports approximately 135 people per year by providing a clean, sober living environment, nutritious meals, and employment assistance. 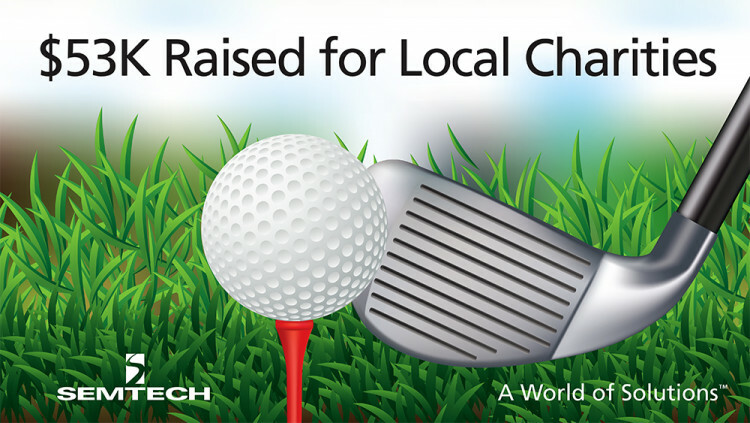 “RAIN Communities is so grateful for Semtech and its golf tournament sponsors’ support. These funds will immediately provide assertive professional counseling and support to the many underprivileged yet resilient families going through this life restoring program,” said David Kohlmeier, Board President of RAIN Communities, Inc.
Semtech and the Semtech logo are registered trademarks or service marks, or trademarks or service marks, of Semtech Corporation and/or its affiliates. Third-party trademarks or service marks mentioned herein are the property of their respective owners.